my nikah ceremony was held at masjid al-mawaddah at sengkang. it's a new mosque and has a very nice and small air-conditioned event hall with a simply decorated wedding dais. these are the most important people for my wedding. my IBU in grey and her sisters. they did help me quite alot in the wedding preparations and without them, it would have been a bigger challenge. this is sabreena and halawah. my favourite girlfriends who stayed back late the night before as they were helping me pack the wedding favours. i love this girls and they were there for me throughout. my ibu. the one who took care of me since i was 2.
i'm also taking this opportunity to thank my God sent service providers who helped me out alot throughout the whole process. the number ONE on my list. abg hadi was a miracle. he saved us from a bad experience we had with another bridal company. to cut the story short, the kind hearted abg hadi decided to provide us with his services and did an amazing job by producing 5 new outfits for me in less than 6 months. 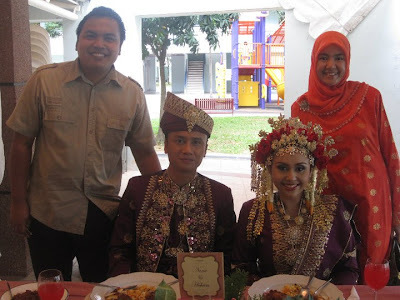 i first met him during my girlfriend's wedding and we have become acquaintance since then. his works was indeed flawless and exclusive as compared to some other bridal companies. not to mention that i LOVE his make up. it is simple and comfortable to put on the whole day. i didn't feel cakey at all and i looked like myself! my experience working with abg hadi and his fabulous team has been nothing more than a pleasure. he listened to what i wanted and improvised on the designs. he realised my dream of wanting a pink princess barbie gown! but let me tell you this, before you start pointing fingers and say that he treats me such because i'm a "celebrity", than YOU"RE WRONG! he treats all his clients just the same. i've seen it myself and i'm had so many girlfriends who used his services and was given the same fair treatment. abg hadi is very accomodative. the point is, if you're nice and kind to people, of course you will get the same in return, right? so, brides to be, as much as your big day is THE MOST IMPORTANT thing to focus on, make sure that you still keep your calm and be nice to your service providers especially your mak andam, because they are the ones who are going to make you look pretty on your wedding. 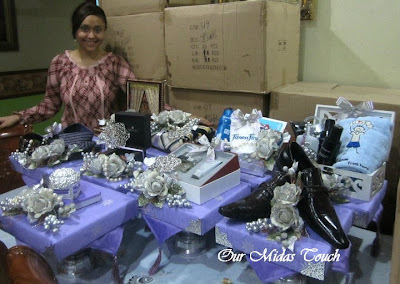 our wedding gifts for both hisham and my side were done up by Mira from Our Midas Touch. i love her works as it is simple yet elegant. it was also such a pleasure to work with her. Mira listened to what i wanted and tried her best to go about executing. she managed to find a LILAC songket for me! it was really sweet of her to go all out to find the songket for me as a base for the tray designs. 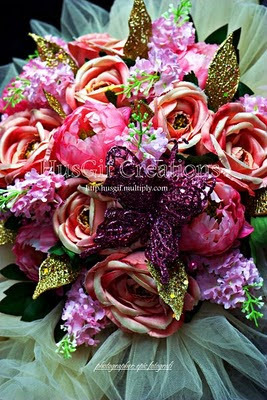 initially, when i met Nora, it was just to discuss on ONE hand bouquet that is made from clay. 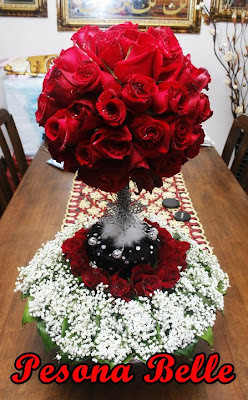 i have never been a fan of fresh flowers because i feel that they die too quickly.. hehe.. therefore, the idea of having a clay hand bouquet was just perfect! the flowers looked real and it's actually much lighter to carry around as compared to fresh flowers! however, Nora did THREE hand bouquets for me which was a very pleasant surprise! she managed to coordinate the colours of the flowers to my outfits and it went perfectly together. ahhh.. the bridal henna. 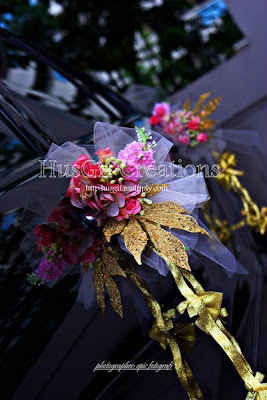 a must for most singaporean malay brides. Wanie from pesona belle was kind enough to offer me her services after a prior service provider decided to play punk on me. therefore, Wanie became my henna saviour! Wanie from Pesona Belle is a bubbly and friendly person to begin with. She made me feel comfortable during our initial meet up session and her warmth reassured me that she will indeed deliver as promised. 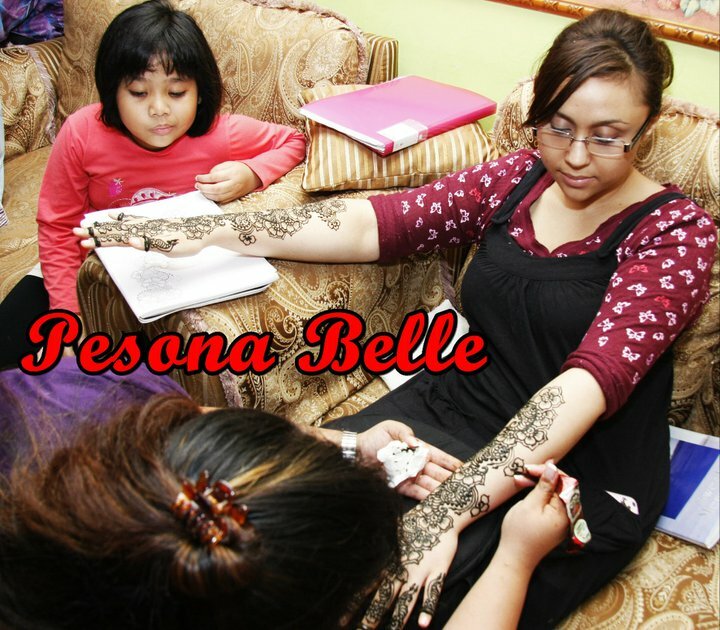 Wanie and I discussed on the henna design and i did email her a couple of designs that i liked. she improvised on the ideas and came up with something that pleases me. on the actual day of my henna application, Wanie came all prepared and focused. throughout the long 4 hours, she remained chirpy and continued to make me feel comfortable throughout the session. not to mention her amazing talent for detailing. my henna artwork turned out gorgeous and received many compliments from relatives and friends. I would highly recommend Wanie to doll up your hands and feet with her pretty henna designs and intricate artwork. besides her henna service, Wanie also did my Sireh Dara which was so unique and different from those conventional ones. I was very much pleased with it as it suits my taste. 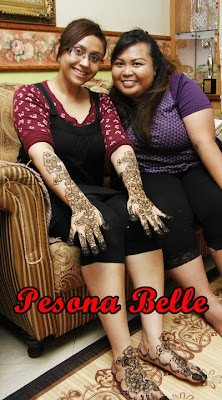 two thumbs up for Wanie and Pesona Belle! I am really glad that they were part of my wedding and i'm sure most brides to be out there will feel the same if they engaged Pesona Belle's services. one week before my wedding, i was scrambling for someone to do up my car. it was seriously the last thing on my mind and i totally overlooked it. 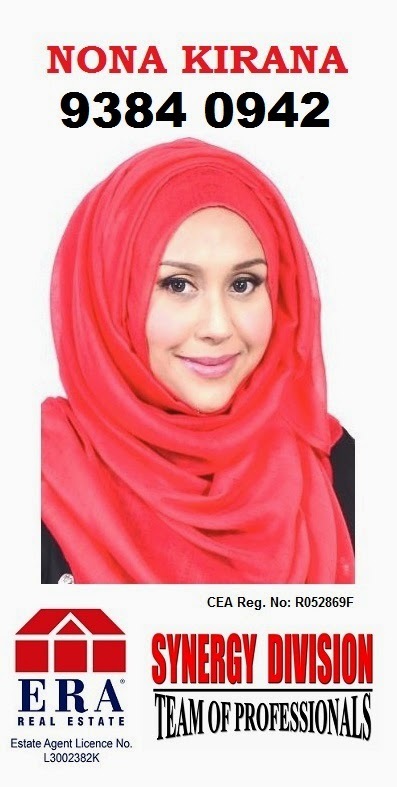 however, after asking Nora for some contacts, she managed to hook me up with Kak Husna from Husgif. she is yet another angel who came from nowhere. she agreed to do up my bridal car despite the tight timeline given to her. hisham and i felt that our bridal car should just be our own car. no other fancy vehicles because we wanted to keep it real. 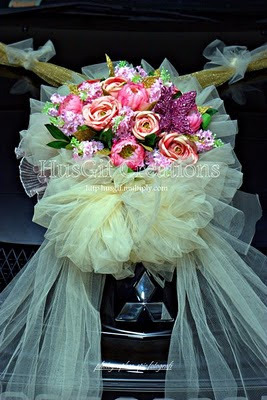 so, yes, our bridal car was our humble mitsubishi which turned pretty after Kak Husna's magic touch! 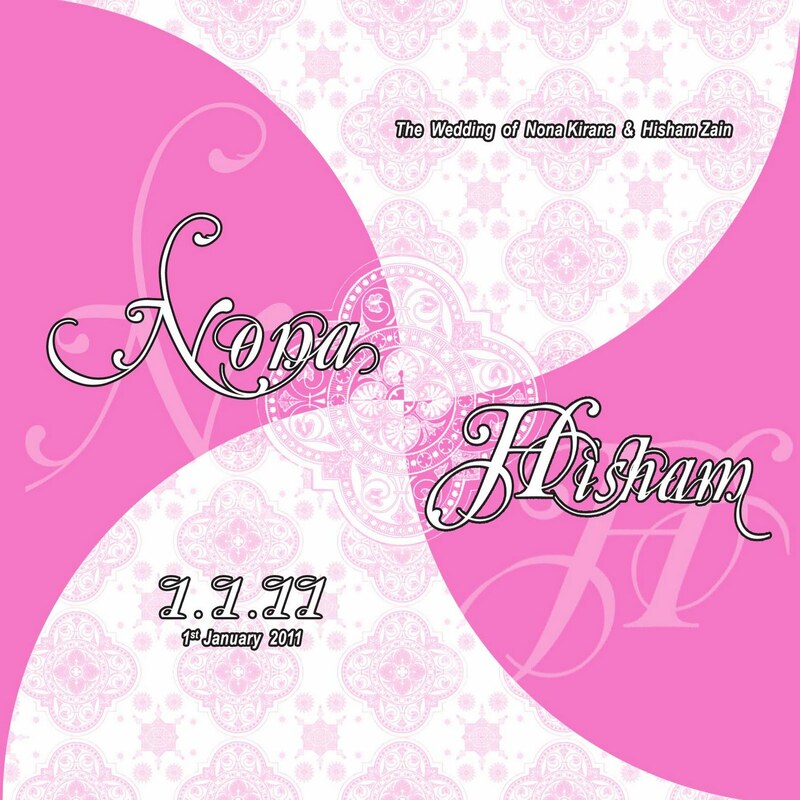 Shah and his team did an EXCELLENT job on my pre-wedding videos, photo montage as well as the actual wedding video. it was so much fun working with him despite the long hours of shooting. i have to say that i was very impressed with his level of professionalism. his equipments are industry standard and his filming studies background just made things a breeze. he listened to what we wanted and went with the flow, always saying.. sure.. can.. why not.. Shah is a talented videographer and his passion in doing this is very much apparent. despite his crazy schedule, (if you didn't already know, he is from the group REVALINA) he made sure that he met the datelines and delivered the goods as promised. Ridz, my favourite photographer of all time. you snapped us during our engagement and you did it again for our wedding. thank you for making us feel comfortable throughout. your amazing shots captured the essence of the moment. we are totally in love with our wedding album! thank you to my aunties and uncles for working together and cooperating really well throughout my wedding.. especially to Mami Siti and Uncle Jamal who allowed me to use their house for the 2 day event. thank you to my male and female cousins for making the event an even more joyous one with your humour and presence! 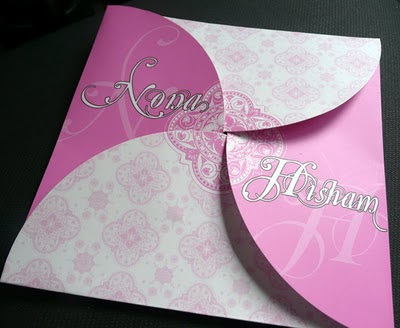 to hisham's side of the family, thank you for accepting me as part of your clan now. i am very happy to be part of such a happy and big family. thank you also to those who made the time to come down for my wedding. i know it's new year's day and that is why i truly appreciated the effort in gracing my humble event. to everyone else who was directly or indirectly involved for my wedding, my heartfelt thank you for making this possible. Even you'll be able to show your wedding videography to your youngsters and grand-children however you were in your wedding and the way your wedding was performed, for more information click here Jacksonville video production companies. I'd contest your take on the word humble. I reckon your "humble" wedding whoopped out at least $25,000-$40,000 smackeroos? I'll share with you a humble wedding I witnessed. It had only 50 guests invited to a solemnisation in a house with no gifts show-off, no exorbitant wedding decor, no ridiculously-priced rented clothes and all that cultural hassle-smazzle. For less than $2000 spent, the couple had a simple, beautiful, intimate and meaningful Islamic wedding. Good food was fed to the guests, everyone minggled and the newly-married couple had proper interaction with their guests. They'll remember the people who witnessed the most important day of their lives. However, for many others, wedding expenditure and the narcisstic culture of it all is deemed "important" to upkeep family pride. The true sanctity of marriage these days is obviously skewed.